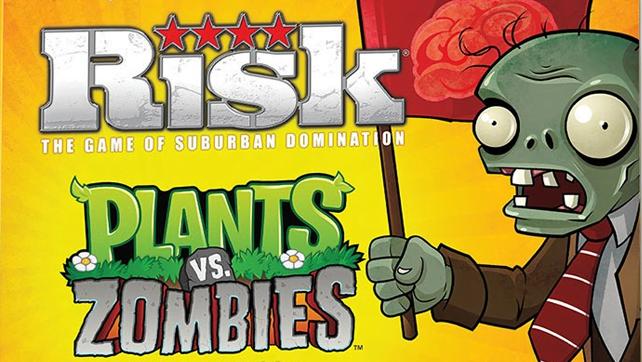 What do you get when you mix RISK and Plants vs Zombies? 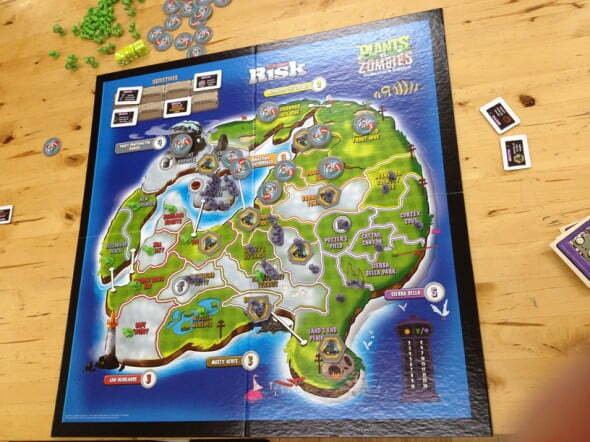 RISK: Plants vs Zombies Collector’s Edition! We recently attended the launch party, come read what we thought. On October 26th, the Redmond Town Center was host to several zombie-themed events. 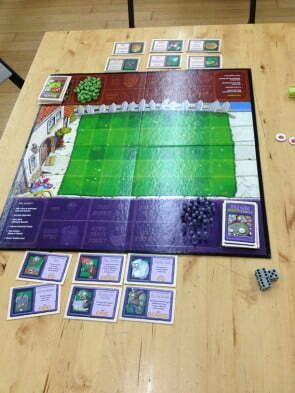 At 2 PM, the “Thrill the World – Redmond” event came to a crescendo with a world-wide simultaneous zombie dance, and just several hundred feet away, Uncle’s Games began setting up the boards for the new PopCap board game – RISK: Plants vs. Zombies. I decided to head down to the Town Center to give the game a try, and let you all know how it is. The event was halfway through by the time I walked in, so I was able to grab an unoccupied board, and one of the Uncle’s Games staff members came over to show me and another how to play. I chose plants, he chose zombies, and the game was underway! It was easy to learn, with principles that mimicked the video game. At the beginning of each turn, you rolled two die, which determined the number of actions you could perform and the amount of pieces you could put on the board. For example, I would roll a 2 and a 6, and then get to decide if I wanted to take 2 actions and place 6 pieces, or take 6 actions and place 2 pieces. But since each square can only perform one action per round, getting pieces on the board is critical in the beginning. Plants can shoot from a range, but for every ranged attack action you take, you have to roll a 6 to kill a zombie. With the max amount of plants being 3 per tile (meaning you get to roll 3 die), I was actually surprised at how rarely a 6 showed up for me. Unfazed by my puny rolls, my zombie opponent kept nearing closer. He managed to buy a permanent effect card by discarding some great temporary cards, and gave all of his pieces the ability to move two squares per turn. Since the zombie side already move once per turn at the start of each turn automatically, he was covering three squares per turn, and I soon found myself overwhelmed. 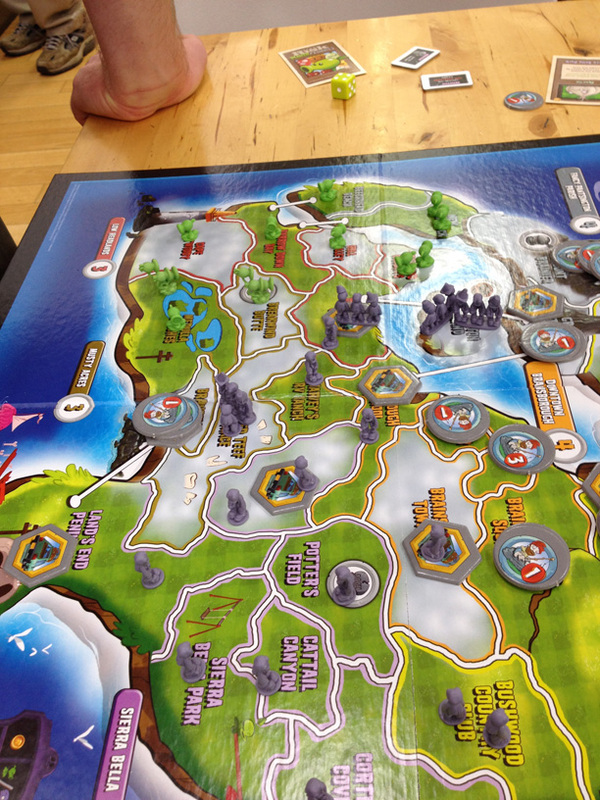 The game’s battle mechanic is actually pretty innovative, guaranteeing balance, but requiring different strategies. As the plants, ranged attacks can’t be defended against. But when zombies reach the square next to the plants, they can start rolling die to defend against attacks, and if they end up rolling higher than you, you actually lose plants. Conversely, the automated forward movement at the start of the zombie turn becomes an indefensible “eat plant” attack which succeeds if the zombie player rolls a 4 or higher. Cards can be played to increase defensive rolls, make plant attacks kill zombies if they roll 5 or 6 (doubling your chance), and more! The game was quick, as the super-fast zombies broke through my weak side, but it was fun! 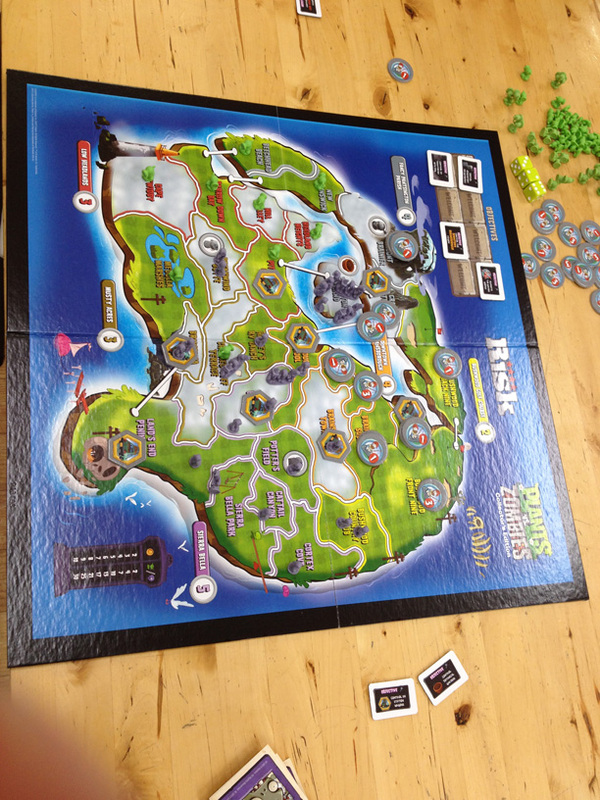 And then I learned that the other side of the board was an actual RISK-like game! 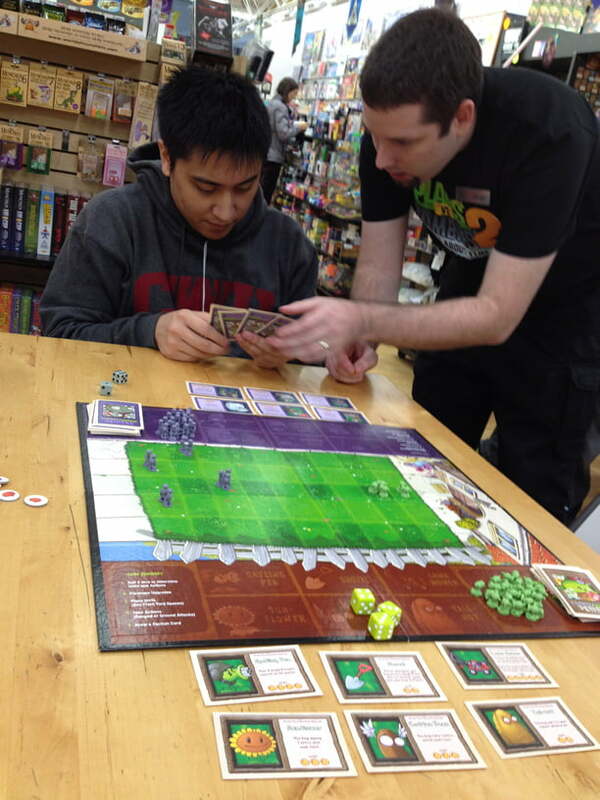 The stranger who had defeated me took his victory and left, but one of the employees sat down to play with me, while a PopCap employee looked on. Anyone who has played RISK will have an easy time figuring out how to play this version. It has most of the same rules and turn order as RISK, but unlike RISK, it doesn’t take 14 hours of game time to finish. The map is also littered with “garden gnomes”, which act as independent forces to slow your movement, “station wagons”, which count as extra territories, and “fog territories”, which are actually harder to attack. There are two ways to win: gain three objectives, which are centered around capturing certain territories, or wiping out your opponent. I switched to the zombie side this time, as the plants had failed me previously. The game began with both teams on opposite sides of the board, with gnomes, station wagons, and objectives guiding us. With no real idea of what to do, I decided to at least capture the Sierra Bella territory where most of my forces had started. This would give me an extra five armies to place at the start of each turn. My opponent began an incursion north, and took an objective by his second turn. A few turns later, as he took his second objective, I realized that he could win the game within the next two turns unless I started focusing on objectives over territory. Luckily, with the army boost that I had from controlling the area, I could do something about it. The game really came down to one moment when he was moving an army of nine plants up to take a fog territory (and win the game). Attacking into fog territory is harder, because where you would normally roll three die with a large enough attacking army, you can only roll two. Defenders always roll two die, until they are down to their last man and are forced to roll one. What makes attacking into fog even more dangerous is that tied die rolls go to the defenders, killing some of your units. The defenders made some good saving rolls, and the attacking force was depleted until only one unit was left on each side. At this critical juncture, I actually held my breath as the last roll was thrown, and felt relief wash over me as the attackers lost. After losing a chunk of his army, my forces were strong enough to charge in and take control of three objectives in just a few turns, and I won. Overall, the RISK: Plants vs. Zombies Collector’s Edition is both fun and stimulating. 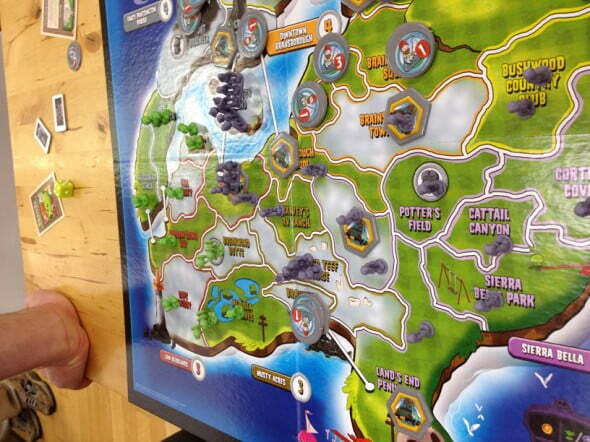 It was actually one of the most enjoyable board games I’ve played in a long time. The game is well-paced, meaning turns are short enough that players don’t get bored. The only downside is that the game is only designed for two players at a time. It’s not a social party game like Settlers of Catan, so it would be an awkward game for any get-together, unless you had several boards. However, it does function really well in pitting one player versus another. In my opinion, it is worth the $30 price tag. When he's not busy dancing in the rain, Jerimiah prefers to sell his soul to the various dominatrices that are rogue-like and indie games. Remember, losing is Fun!